Alexandria City Hall is located at 704 Broadway, Alexandria, MN 56308; phone: 320-763-6678. Photo: Thomas F. Cowing House, ca. 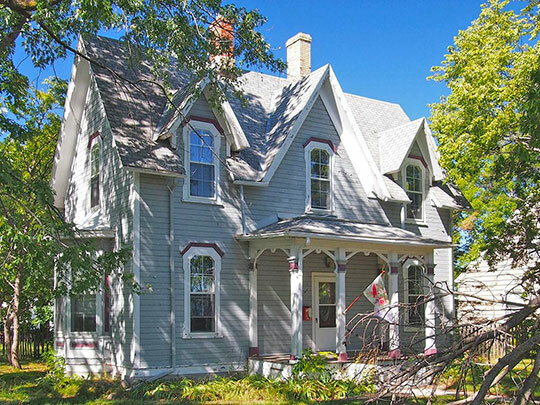 1875, 316 Jefferson Street, Alexandria, MN. Listed on the National Register of Historic Places in 1985. Photographed by user:McGhiever (own work), 2013, [cc-by-3.0 (creativecommons.org/licenses/by/3.0)], via Wikimedia Commons, accessed July, 2016. Alexandria was first settled in 1858 when brothers Alexander and William Kinkead built a log cabin on the shore of Lake Agnes near its union with Lake Winona. The first Kinkead cabin was built along the route of a new government road which was surveyed in 1858 to link the Mississippi River at St. Cloud with the Red River near present day Breckenridge. The Kinkeads were followed to Lake Agnes by a handful of settlers who became Douglas County's first pioneers. In 1859 a townsite company was formed and the townsite of Alexandria was surveyed. After an apparently solid start, however, the settlement was abandoned when settlers fled the violence of the U.S. Government-Dakota Conflict which began in August of 1862. Despite the fact that the government built and manned a log stockade called Fort Alexandria at the site in late 1862, settlers did not return to the area until 1866 when the soldiers were withdrawn from the fort. A new townsite was platted in 1868 and growth proceeded again, this time uninterrupted. Settlement of the community was given considerable impetus during the winter of 1868-1869 when a government land office was established in Alexandria. During the next several years, hundreds of pioneers seeking farms in west central Minnesota passed through Alexandria to conduct business at the land office. The St. Cloud and Fort Abercrombie Road, as the government road through Alexandria was called, remained the settlement's primary link with the rest of the state until the late 1870's. J. C. Burbank and Company of St. Cloud operated a stage coach service along the road from 1859 to circa 1874, and other stage and freight lines linked Alexandria with railheads at Morris and Melrose after 1871 and 1874. In 1874 the Northern Pacific grading crew came through Alexandria, solidifying expectations for long awaited rail service. It was not until four years later, however, that the first train (now under the flag of the St. Paul, Minneapolis, and Manitoba and soon to become the Great Northern) arrived in Alexandria in 1878. With rail transportation now available, Alexandria and the surrounding townships in Douglas County were settled rapidly. Scandinavian, German, Austrian, and Yankee homesteaders streamed into the region to establish farms. Roads were constructed and rural schools and churches established. Nine of Douglas County's twelve major townsites were established along the route of Great Northern and its competitor, the Soo Line, which was built through the county in 1903. In addition to simply providing transportation, the Great Northern, and later the Soo, actively platted townsites, advertised settlement opportunities in the county, and promoted Douglas County's fledgling tourism industry. The Great Northern brought to Alexandria a means to market grain produced by the county's farmers and a method of bringing inventory to the town's businesses. The city soon became a major agricultural marketing and service center. The Great Northern's depot (built on Lake Agnes at the north end of main street) and various warehouses and grain elevators which were built along the tracks, became the focus of daily commercial activity. Rail service in the late 1870's also allowed Alexandria to capitalize on the abundance of lakes and woodlands which surrounded the town. These proved ideal for fishing, hunting, and vacationing. A successful county-wide resort industry began with the construction of a tourist hotel in Alexandria in 1880 and the establishment of small fishing resorts on nearby lakes. Susan Granger and Scott Kelly, Gemini Research, Alexandria Residential Historic District, Douglas County, MN, nomination document, 1989, National Park Service, National Register of Historic Places, Washington, D.C.